We are very proud to announce that "The Weirdo Hero" is featuring members of the Abbotsford Special Adventurers in our movie. The Abbotsford Special Adventurers is a non-profit organization for teens and adults with disabilities. The program is totally funded by their own efforts and by the community and their donations. They meet on Wednesday nights during the school year for games, crafts and other activities. There are 32 clients and 18 volunteers. The program is unique, as they are an evening recreation program for these special folks. The program also goes on weekend camping trips and weekend day trips through our program season. 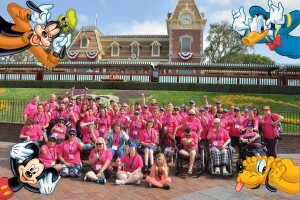 The Special Adventurers have also gone on Dream Trips to Disneyland and Calgary/Edmonton. 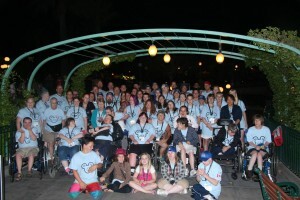 The last trip to Disneyland had several members of ECCW joined the group as chaperones and ECCW is a long-time supporter. We are teaming up on Feb 21 to do a Charity Wrestling Show to help send the Special Adventurers on a Day Trip to Seattle to the Woodland Park Zoo and Seattle Aquarium, again several members of ECCW will be chaperoning on this trip also. Special Adventurers Website. In 2014 some ECCW wrestlers including, Ravenous Randy Myers, traveled with the Special Adventurers as chaperones to Disneyland. See if you can spot the Ravenous One in these 2 pictures.